In a battle of regional powers Saturday in Harrisonburg, it quickly turned into a battle that never was. The Eastern Mennonite University (EMU) women’s basketball team never trailed as they opened with a 26-2 barrage and rolled over visiting Ferrum by a final of 81-65. The Royals improve to 6-1 as they get a few days off for final exams. The women have now won 22 straight at home. Ferrum, an injury-hampered team which was picked to finish second in the USA South, slips to 2-3. Eastern Mennonite had a 4-0 lead just 20 seconds into the game, as Sa’Mone Moore (Covington, Va./Covington) buried a pair of long jumpers. Jess Rheinheimer (Manheim, Pa./Lancaster Mennonite) then scored the next eight, including a pair of three pointers, as the women led 12-0. Ferrum got their first bucket at the 16:19 mark, but the Royals scored the next 14 points, including four more triples, to blow open a 26-2 cushion just 8:33 in. The Panthers rebounded with a 13-2 run to get within 28-15. EMU stayed hot from outside, however, and never let their visitors back to within single digits. 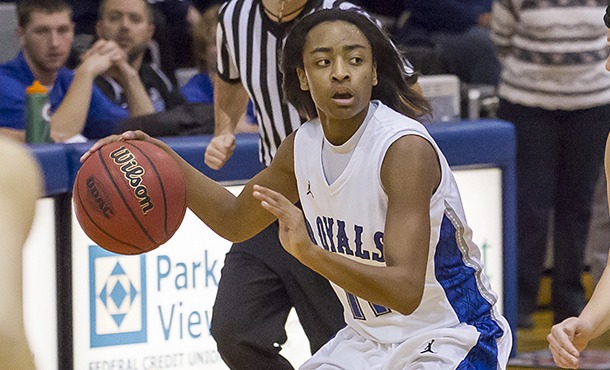 The Royals hit 10-of-13 three pointers in the first half and led 46-31 at the break. They finished 12-of-27 for the game, but still out-shot Ferrum 49 percent to 44 percent. EMU also had a 36-30 edge in rebounding. Rheinheimer was unstoppable and led the charge with 23 points, seven rebounds, five assists and three steals. Marla zumFelde (Goshen, Ind./Bethany Christian) drained 6-of-9 three pointers and finished with 18 points and two blocks. Shakeerah Sykes (Dumfries, Va./Forest Park) came in with 10 points and Moore charted nine. Alisa Brown (Dumfries, Va./Forest Park) had the eye for the open shooter and racked up 10 assists, easily breaking her career best for a game. She now has 17 assists over EMU’s last two outings, as the senior had seven handouts in Tuesday’s 81-76 win at Randolph-Macon. Zarkia Mattox led Ferrum with 18 points, seven rebounds and five assists off the bench. Jacole Hairston scored 14 while Kemani Crawford added 12 points and seven boards. EMU has the week off before playing next Saturday at The Apprentice School. Game time in Newport News, Va., is 2 p.m.